For me, the best way to cap a conference about saving nature is to go out and walk around in some. After two days spent indoors in windowless conference rooms, I sneaked away a little early to take a hike through Middle Fork Woods–the 4th of 50 Illinois Nature Preserves I plan to visit this year in celebration of the publication of the Fell biography. Don’t get me wrong, spending two days with close friends and colleagues at the annual Vital Lands Illinois conference is, well, vital. Initiated several years ago by the Grand Victoria Foundation, Vital Lands Illinois is a network of public and private land conservation from across the state, working together to coordinate and enhance land conservation. 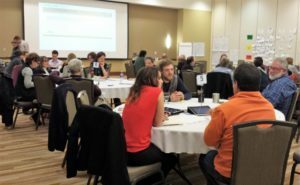 At this year’s conference, we greatly expanded our horizons by including a dedicated consideration of mitigation and agricultural programs to bolster land protection efforts. For the past couple of years, we’ve held the annual VLI conference at the University of Illinois, in Champaign-Urbana–alma mater for both me and George Fell. 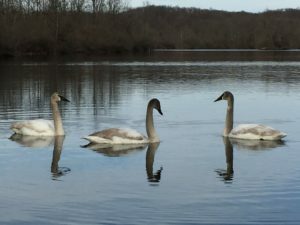 There are two dedicated Nature Preserves in Champaign County, but one is on private land and access to the other requires permission from the local forest preserve district. So, I headed straight east into Vermilion County to Middle Fork Woods Nature Preserve, located in Kickapoo State Park. The preserve is named for the Middle Fork of the Vermilion River, the only river (rather, a 17.1-mile section thereof) in Illinois designated as a National Wild and Scenic River. Ironically, what makes this stretch of the river particularly wild and scenic is the very thing that destroyed much of the adjacent landscape. Along its meandering course, the river has cut into layers of bedrock formed during the Pennsylvanian Age, 320 million years ago. Among the strata–or layers–of bedrock are sandstone, siltstone, limestone, shale and–most significant–coal. Dating back to the mid-1800s, there have been more than 150 coal mining operations in Vermilion County. 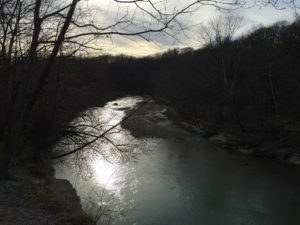 In fact, the first coal strip mining in the United State occurred in Vermilion County, and that–along with slope mining–is exactly what happened at what is now Kickapoo State Park and the adjacent Kickapoo State Recreation Area. Between 1918 and 1924, Surface Mine No. 6 and Slope Mine No. 6 produced nearly one million tons of coal. 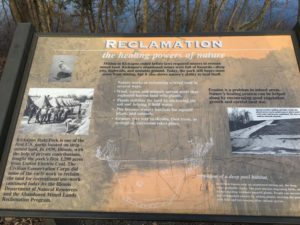 Today, mining laws require companies to restore mined lands to their original condition, but not so when Vermilion County boasted another first in 1939: the first wasted minescape to become a state park. 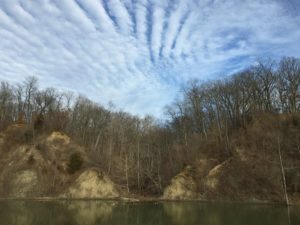 On a cold winter day, stripped of its foliage, much of Kickapoo State Park is revealed for what it is–a reclaimed minescape: the deep water ponds, the tailings, the sheered-off cliffs, the erosion gullies and, of course, the sealed-off mine entrances. Nonetheless, there is an inherent regenerative power in nature that has softened the scars we have left, providing habitat for many plant and animal species, as well as a restorative hike for a conference-fatigued individual such as myself. 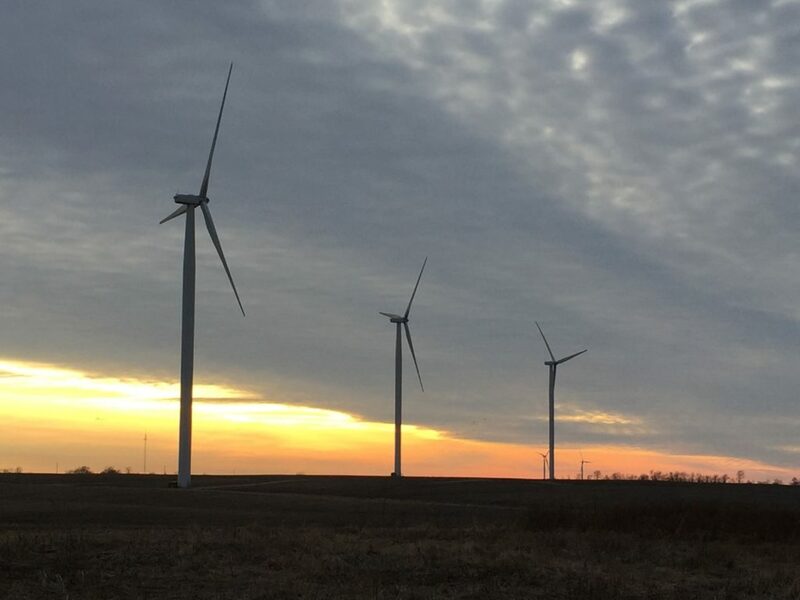 Incidentally, on the way home, I spied nearby a next generation of energy production on the prairie. Perhaps no source is perfect, but is harnessing the free wind perhaps better than the extractive practices of the past?